The Wisconsin State Senate in early December approved the appointment of Rose Dolatowski of Burlington to the Wisconsin Board of Nursing. Rose will serve on the board until 2022. Rose is a Masters-prepared school nurse and has served on the boards of both the National Association of School Nurses (NASN) and the Wisconsin Association of School Nurses (WASN). Rose will bring to the Board of Nursing the unique perspective of someone who has worked on the front lines of school and public health. She will be able to help with issues like the delegation of medication in school settings. Rose’s appointment achieves the long-time goal of WASN to have a school nurse appointed to the Board of Nursing. NASN encourages its affiliates to advocate for school nurses to be put on the governing boards because the boards have a great deal of influence over the nursing profession. Jack O’Meara advised Rose on her pursuit of the appointment. Jack also advocated for Rose’s appointment with the Governor’s office, Assembly Speaker’s office, and a key State Senate office. When it approved its 2019–21 operating budget proposal on August 23, the University of Wisconsin Board of Regents recommended a statutory change designed to bring more private resources to the university. The proposal was developed by the PROFS (UW-Madison faculty) Entrepreneurial Work Group. A broad coalition of business, university, and high-tech advocacy groups supports the plan. The statutory change is known as the Mark Cook Bill, in honor of the late faculty member/entrepreneur who led the PROFS Entrepreneurial Work Group and felt strongly about the need for the change. Mark passed away from cancer in 2017 at the age of 61. The proposal will streamline the process for approving outside contracts with entities where faculty or staff have a financial interest and at the same time strengthen the ethics law by requiring management plans. It will add non-profit funding entities to the statute. Introduced last session as AB 758/SB 671, the bill received unanimous committee votes in both the State Assembly and State Senate, and passed the Assembly on a voice vote. It got caught in the legislative log jam at the end of the session and didn’t quite make it onto a Senate calendar before the Legislature adjourned for the year. Current law hinders the UW’s ability to move quickly to bring R&D expenditures from businesses and non-profits to the university. Some funding entities have been forced to take initiatives, including clinical trials, to other states. And faculty have left to go to other universities and states where they can work more collaboratively with funders. Early next year, the governor will introduce his version of the 2019-21 state budget, including a UW System budget, taking into consideration the UW regents’ budget proposal. The state budget then goes to the Legislature, which will consider, amend, and ultimately send the budget back to the governor, who will sign it into law with partial vetoes. The 2019-21 biennial budget runs from July 1, 2019 through June 30, 2021. It is expected that the Mark Cook Bill will again be introduced as separate legislation. The coalition advocating for the bill will push to either have it included in the state budget, as the regents recommended, or passed as a separate bill. Raising the subsidy rate by 5 percent for infants (ages 0-2) and for young children (ages 2-4). Establishing a statewide minimum subsidy rate of $5/hour for infant care at licensed providers. Reducing the penalty imposed on parents who choose a 2-star provider (the Department of Children and Families says it will be using more of a carrot, rather than a stick, approach to encouraging 2-Star providers to increase their star ratings). 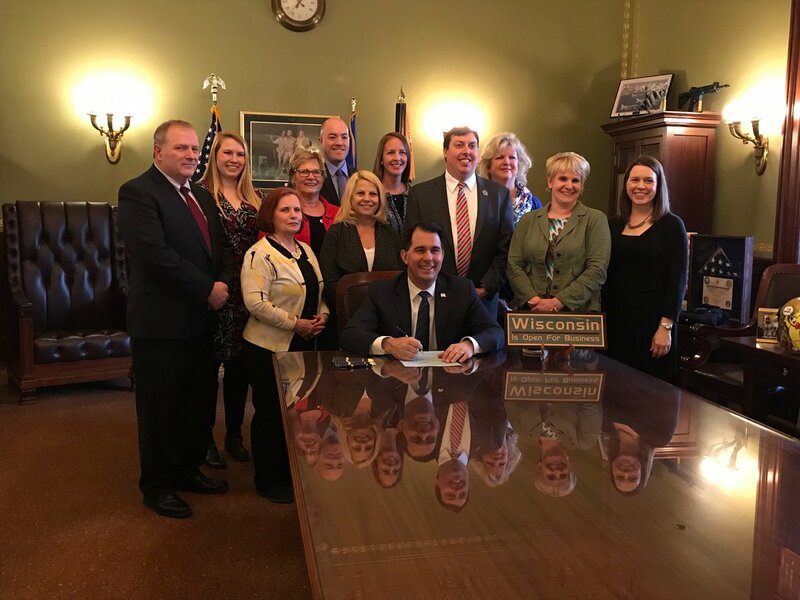 On April 3, Governor Walker signed legislation that provided $8 million in funding for the Wisconsin Shares child care subsidy program this biennium. The new law also boosted eligible YoungStar quality bonuses for 4-Star providers from 10% to 15%, and from 25% to 30% for 5-Star providers. The lead authors of the legislation were Rep. Mark Born (R-Beaver Dam), Senator Alberta Darling (R-River Hills), and Rep. Jesse Rodriguez (R-Franklin). The legislation was introduced on February 9 and was approved by the full Legislature just 11 days later. It passed the Joint Finance Committee on a 16-0 vote and then was approved by both legislative houses on nearly unanimous votes. Capitol observers were amazed at how quickly and decisively the legislation was approved. It is a testament to the tireless advocacy of child care administrators, teachers, families, and advocates throughout the state. 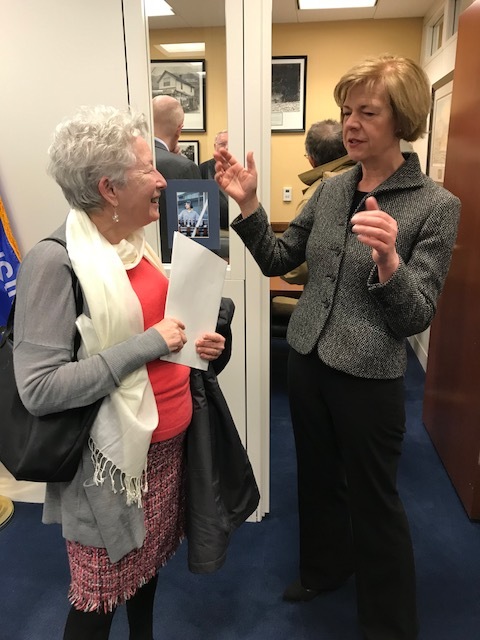 In mid-March, Jack O’Meara and Dorothy Farrar Edwards, PROFS President, traveled to Washington, D.C. to take part in the Wisconsin Alumni Association Federal Lobby Day. Along with other UW-Madison stakeholders, Dorothy and Jack advocated for more research funding and student aid. Jack and Dorothy also did some Hill meetings advocating for the federal government to do more to encourage shared governance, either through the Higher Education Act (HEA) or appropriations bills. Just days after the lobby trip, Congress approved a budget resolution that provided $3 billion more for NIH (the Trump administration had proposed a $7.1 billion cut), $330 million more for NSF (the administration proposed a $133 million cut), and $868 million more for the Department of Energy’s Office of Science (the administration wanted a $920 million cut). Important funding was restored for student aid, and the discussion over shared governance continues. A bill to make it easier for entrepreneurial UW faculty and staff to work with outside companies and non-profits, and thereby bring more outside funding to the university and encourage more entrepreneurial activity, is moving quickly through the Legislature. AB 758/SB 671, identical bills that will streamline the process for approving outside contracts with entities where faculty or staff have a financial interest and at the same time strengthen the ethics law by requiring management plans, recently received unanimous committee votes in both the Assembly and Senate. A vote before the full Assembly is expected on February 13, and a vote in the Senate is expected later this month. The PROFS (UW-Madison faculty) Entrepreneurial Work Group identified this change in the law is being high priority. The work group then took the idea to key legislators from both parties. The legislators agreed to introduce the bill. The committee testimony from the entrepreneurial faculty was very well-received by committee members. Just last week, the faculty group had a meeting in the governor’s office, where the governor’s education policy staffer was encouraged to ask the governor to sign the bill into law when it passes the Legislature. Referred to as the “Mark Cook Bill,” AB 758/SB 671 honors the late UW-Madison Animal Sciences Professor who created four companies from his research and whose work led to 50 patents. Mark led the PROFS Entrepreneurial Work Group and felt strongly about the need for this legislation. Mark passed away from cancer in 2017 at the age of 61. Faculty members taking part in the lobbying for the legislation include UW-Madison’s Thomas “Rock” Mackie, one of the founders of Tomo Therapy, which commercialized the radiation therapy that Mackie and another researcher developed; Jamey Weichert, founder of two companies, Cellectar and Archeus Technologies, both of which have raised many millions of dollars and continue to have enormous potential for cancer treatment; Richard Burgess, founder and long-time director of the UW-Madison Biotechnology Center and founder of a company that is still in existence today at University Research Park exploring more effective ways to combat antibiotic-resistant bacterial pathogens; and UW-Milwaukee’s Carol Hirschmugl and Dean Marija Gajdardziska-Josifovska, who founded SafeLi, LLC, to promote a product from their research — a new anode for lithium ion batteries that will lead to safer, higher capacity, and faster-charging batteries. The coalition supporting the legislation includes UW System, UW-Madison, UW-Milwaukee, Wisconsin Alumni Research Foundation (WARF), Wisconsin Technology Council, BioForward (representing biotech companies), Wisconsin Economic Development Association (WEDA), Badger Advocates, Academic Staff Public Representation Organization (ASPRO), and Greater Madison Chamber of Commerce. 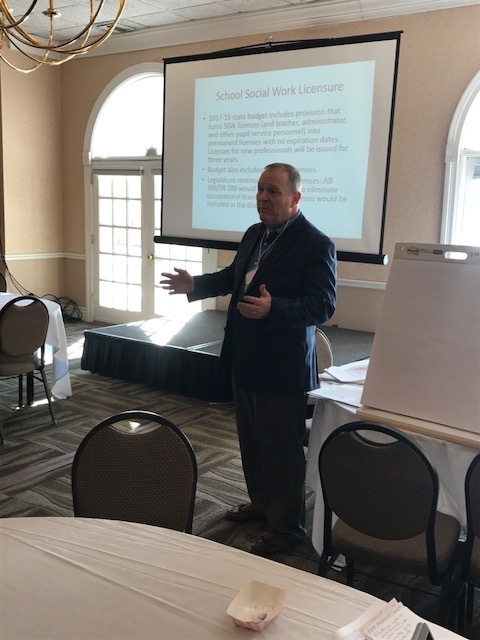 Jack was pleased to lead a Legislative Update/Strategy Discussion Workshop and two roundtables, also focused on legislation and strategy, at the Wisconsin School Social Workers Association (WSSWA) fall conference on Friday, November 10 at the Heidel House in Green Lake, Wisconsin. There was great discussion about the school mental health initiative (highlighted below) that is in the state budget, how to keep up the momentum on that front, and other pieces of legislation both on the “offensive” and “defensive” fronts. The final state budget signed into law by Governor Walker (Act 59) includes the full $3 million for school social workers, part of the mental health initiative developed by State Superintendent of Public Instruction Tony Evers. The budget even includes $750,000 more in school mental health collaborative grants than originally proposed. After Superintendent Evers proposed the funding last year, O’Meara Public Affairs (OPA) took up the cause, with Jack appearing before two committees of the Wisconsin Council on Mental Health. The council then sent a letter to Governor Walker, encouraging him to include the mental health initiative in his budget, which he did. 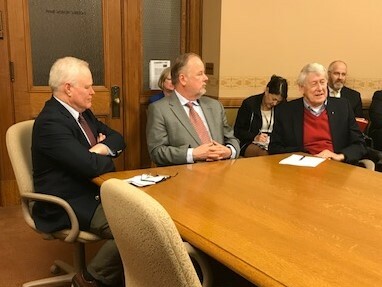 Jack and leaders of the Wisconsin School Social Workers Association then met with members of the Legislature’s Joint Finance Committee, which approved the school social worker funding and included the $750,00 in additional collaborative grant funding. While the need for school mental health programming in the state is certainly greater than what this funding can accomplish, this action recognizes the need out there and is a significant step in the right direction. On June 6, Assembly Republicans, led by Joint Finance Committee Co-chair John Nygren (R-Peshtigo), released their version of a state budget for K-12 education. While the Assembly GOP budget would cut overall funding for education, the budget would retain the $3 million for school social workers as part of the mental health initiative originally developed by State Superintendent of Public Instruction Tony Evers and included in the budget of Governor Scott Walker. The Assembly version would also add an additional $1 million for collaborative grants. We have been meeting with members of Joint Finance to advocate for the mental health initiative, including the school social worker funding. We will continue to advocate for this funding and the best possible result for the K-12 budget. When Governor Walker announced his 2017-19 state budget on February 8, he included the complete school mental health initiative that was proposed by State Superintendent of Public Instruction Tony Evers. The $6.2 million in new funding includes $3 million in a categorical aid program to fund School Social Workers, recognizing the social workers’ vital role in delivering school mental health services. Prior to the announcement, Jack O’Meara joined Wisconsin School Social Workers Association President Julie Incitti in meeting with the governor’s staff to advocate for the initiative. Jack also appeared before two committees of the Wisconsin Council on Mental Health, which then sent a letter to Governor Walker in support of the plan. The Wisconsin Medical Society also sent a letter of support to the governor after Jack put in a request with the society. We will continue to advocate for the initiative as the Legislature works on the state budget. This will include appearances before the Joint Finance Committee by School Social Workers and others concerned about school mental health. It is always dangerous to declare victory in the government relations world because you never know what might happen next and you need to live by the “devil in the details” mantra. That being said, advocates for quality child care — led by the Wisconsin Child Care Administrators Association and in particular the strong leadership of WCCAA President Bev Anderson — scored a big victory in August when the Wisconsin Department of Children and Families (DCF) released its latest plans for its Electronic Benefit Transfer (EBT) program, and, contrary to earlier plans, the YoungStar Quality Bonus will not be placed on the cards, at least during the transition phase of the program. Those of us working for WCCAA and other groups were told this was a lost cause, but we persevered. We kept making the case for why sending the bonuses to providers benefits the children and families who need quality early education and care. We look forward to continuing to work with key policymakers to ensure a great child care system for Wisconsin for the future. Leaders of PROFS, representing the UW-Madison faculty, recently held a great event for Congressman Mark Pocan at the beautiful home of Professor Sue Babcock and Dr. Tom Kelly. 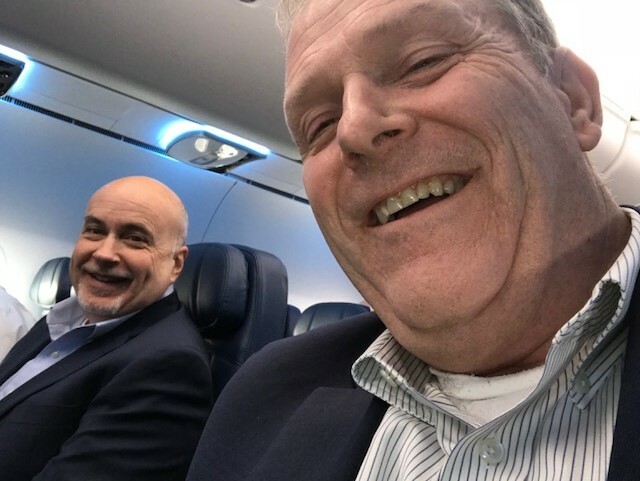 Here is a picture of PROFS President Judith Burstyn and Congressman Pocan discussing the latest issues before Congress. 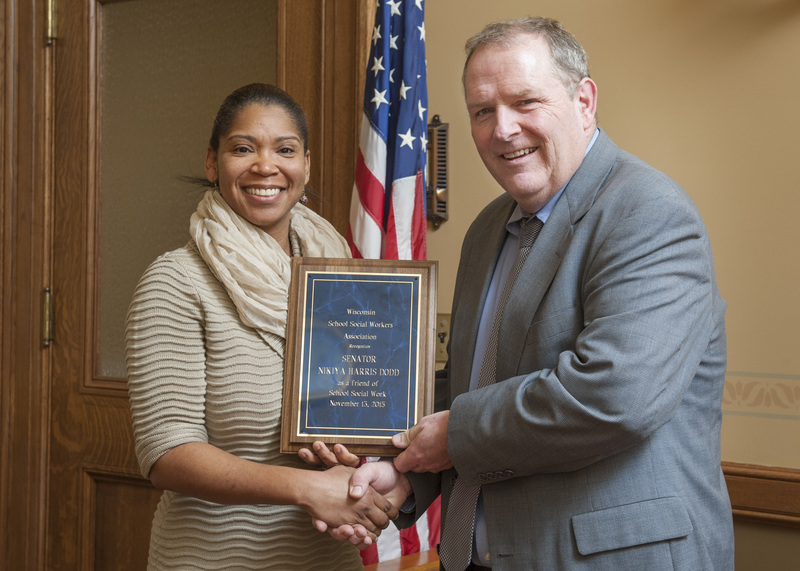 In November, the Wisconsin School Social Workers Association (WSSWA) provided its Friend of School Social Work Awards to Senator Nikiya Harris Dodd (D-Milwaukee) and Rep. Eric Genrich (D-Green Bay). Senator Harris Dodd and Rep. Genrich led the effort to get changes to Wisconsin’s habitual truancy law through the Legislature and signed into law (see article below). 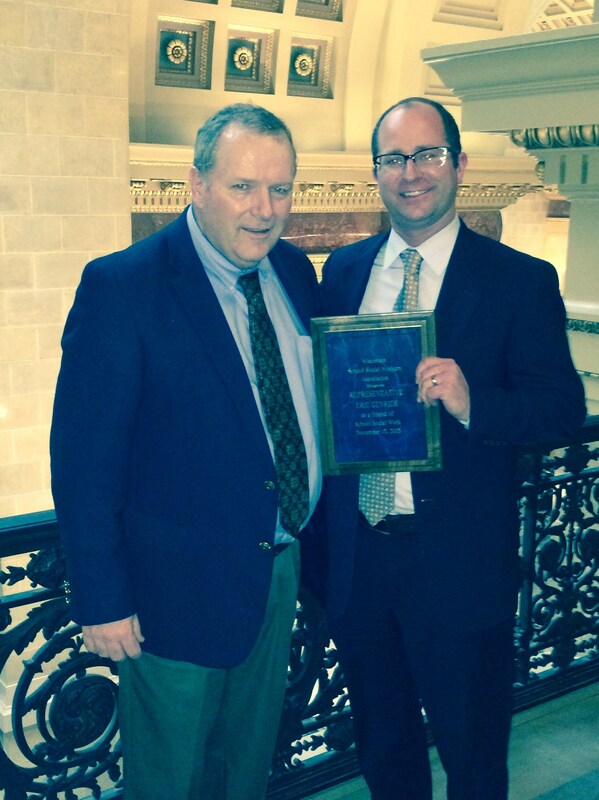 Directly below are photos of Jack O’Meara presenting the awards to Senator Harris Dodd and Rep. Genrich. 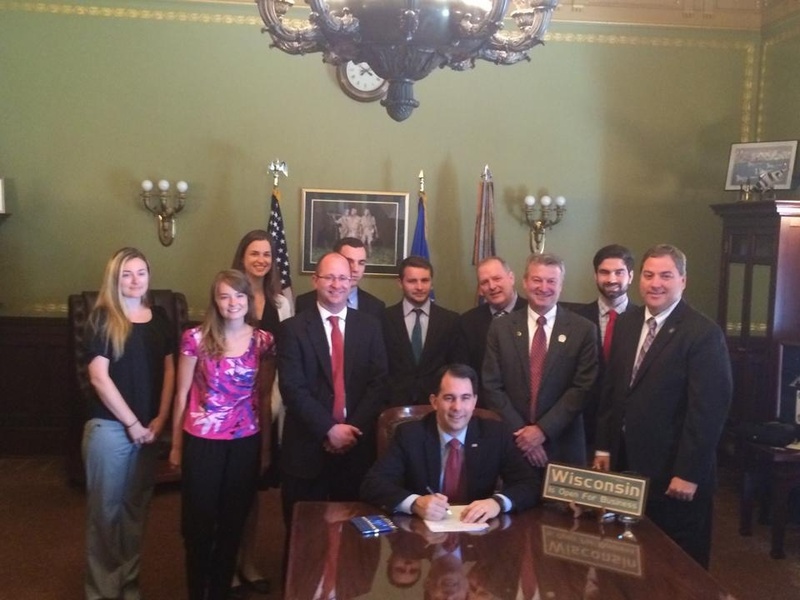 On July 1, Governor Walker signed Senate Bill 122 into law as 2015 Wisconsin Act 52. The act eliminates the previous requirement in state law that parents of habitually truant students be contacted via registered or certified mail. The new law gives school districts the option of using the much-cheaper regular U.S. mail, along with electronic means like email and texting. Working with Jack O’Meara, the Wisconsin School Social Workers Association (WSSWA) Legislative Committee developed the ideas behind SB 122. Jack then took the proposal to Senator Nikiya Harris Dodd (D-Milwaukee). After talking with legislative attorneys and others, Senator Harris Dodd made some adjustments and convinced Senator Paul Farrow (R-Pewaukee) to serve as her Senate co-author. Rep. Eric Genrich (D-Green Bay) agreed to be the lead Assembly author, with Rep. Joel Kitchens (R-Sturgeon Bay) as Assembly co-author. The bill had many other co-sponsors from both sides of the political aisle. Jack testified in favor of the bill before both the Senate and Assembly committees. He was joined by WSSWA members Janelle Peotter, Heather Strayer and Christina Gringle of Green Bay; Mallory Knipe of Black River Falls; and Julie Incitti of Stoughton, who all did a great job. Jack also worked with Rep. Genrich, his staff, and the Wisconsin Association of School Boards and the School Administrators Alliance, to convince Assembly leadership to take the bill up on short notice to ensure the new law is in place for the upcoming school year. Finally, Jack prepared an email to all WSSWA members encouraging them to contact Governor Walker to ask him to sign SB 122 into law. The governor was convinced, and that’s Jack and WSSWA board member Julie Incitti at the bill-signing ceremony. This shows that common sense bipartisan legislation can still make it through the Legislature and get signed into law. Thanks to all who played a role.